Howard Pyle was an American author and illustrator who is probably best known for writing The Merry Adventures of Robin Hood and The Story of King Arthur and His Knights. In 1900 he opened an art school. Some of his art students would later achieve fame including N. C. Wyeth who is known for his illustrations of Treasure Island and Robinson Crusoe. 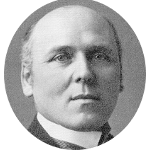 Howard Pyle has at least one U.S. President in his family tree, Richard Nixon. He also has kinship to Allen and John Foster Dulles, brothers who held the posts of C.I.A. Director and U.S. Secretary of State respectively. The singer and actress Jessica Simpson is also included in Howard Pyle's family tree. However, considering the adventures that Howard Pyle liked to write about, it seems only fitting that he would have a family connection to one of America's most colorful and adventurous citizens, Buffalo Bill.